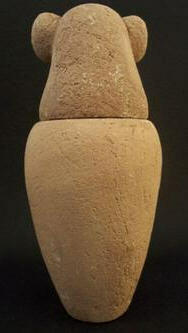 Ancient Egyptian Carved Canopic jar " Late Period "
you bidding on ancient Egyptian canopic jar. 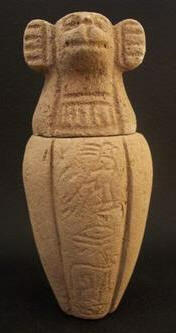 This jar features the head of Hapy.Hapy:guardian of the Lungs. There are hieroglyphic inscriptions on from the book of the dead. 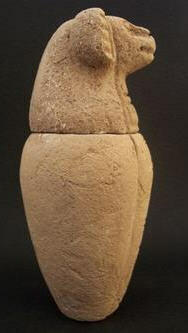 Please watch our future auctions for the rest of the collection of these jars. Carved from stom during the late period. Size --->Tall 13.5 cm(5 3/8inch)xwide 6cm(2 3/8inch)xcircumference19.1 cm(7.5 inch. I obtain my items from various sources (antique dealers some of those dealers have been working in this business since 1930's and 1940's) private collections and or estates), We have received all information regarding our items from second hand sources, and the timeline set on our items is to be used as a guideline for the above period listed. Since I am a collector myself I tend to take pride in the items I aquire. These pieces are wonderful and we present them as they have been represented to us.